“Nothing succeeds like success,” an axiom as true in the art market as it is anywhere else. Entrepreneur and curator Joel Damon, instrumental in organizing various art exhibits and events of all kinds for nearly the past 10 years in the Metro, will stretch once again when his newest space at 5603 NW Radial Hwy, the Citylight Arts Project, opens Nov. 3. Whether singularly, or more often in collaboration with artist Josh Powel, Damon has successfully organized exhibits, DIYs and pop-ups historically and eclectically within abandoned and renovated buildings and storage units, the sorely missed Bemis Underground and his current pet Project Project on Vinton Street. All within an umbrella vision that emphasizes cultural community building while giving emerging artists their first opportunities to be seen and appreciated by viewers in an expanding arts market in the Metro. Not unlike what Project Project has added to the vibe on Vinton Street. CAP’s grand opening will seek to ground itself in the Benson area with an exhibit from a more established artist, Watie White, who happens to have a history of his own in community building and organizing via the visual arts. 8 People, which opens Friday from 6-9 p.m., features eight 8’ tall prints of White’s woodcut portrait murals that will be placed in multiple locations in Benson Nov. 11. “The prints are from my woodcut series, 100 People, those I admire who make the world better in ways that are big and small,” White said in a show statement. “Generally, these are people who are surprised and flattered that someone – an artist – would be taking an interest in them and their stories. It’s a daunting task, but not beyond the purview of contemporary art. Plus, CAP has a proven track to run on. 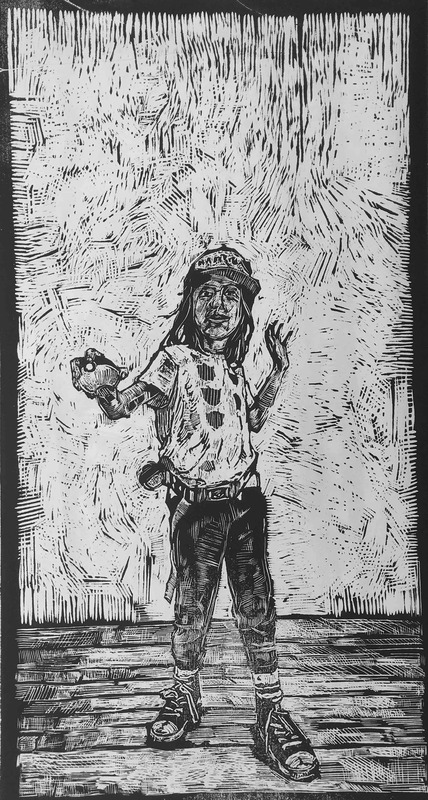 8 People, eight 8’ tall woodcut prints opens Friday, Nov. 3 from 6-9 p.m. at Citylight Arts Project, 5603 NW Radial Hwy. The exhibition will be available for viewing by appointment until Dec 2. For details, visit https://www.facebook.com or go to citylightartsproject.com.